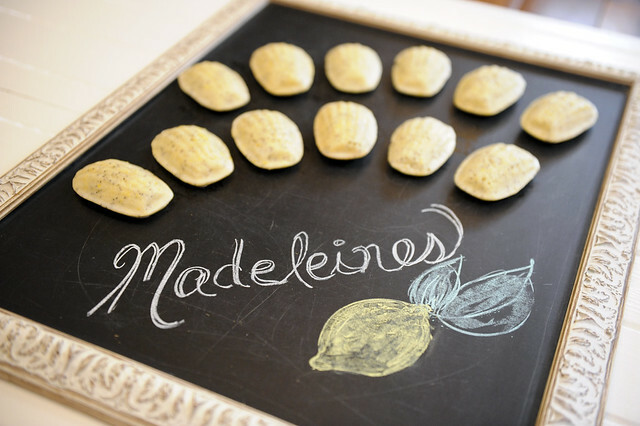 Chronicle Books recently invited readers to submit their favorite recipes for Madeleines, as part of their first ever crowd-sourced cookbook We Love Madeleines. For my submission, I wanted to put a flavorful twist on the classic cake-like cookie. I found inspiration from one of my favorite morning treats -- Poppy Muffins. In this case, the ingredients are not too different from the muffin, just mixed together differently. The flavor is intensified with Meyer Lemons. The end product is presented in a petite shell and the "sugar on top" -- literally speaking -- is a sweet citrus glaze finish. Voila! 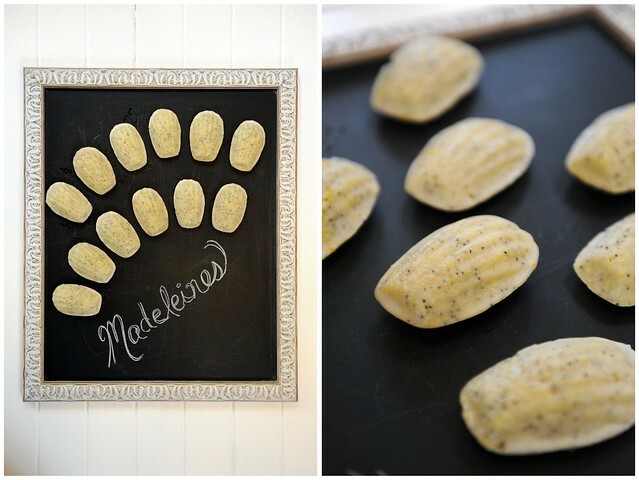 Lemon Poppy Madeleines. And it's love at first bite. In a small saucepan over medium heat, melt butter until it has a golden brown hue with a nutty aroma. Set aside to cool. Apply a coating of butter to your madeleine pan using a paper towel. Dust with flour, tap off excess and freeze pan for 1 to 3 hours. This will help your delicate madeleines get a light, crispy outershell shell that won't stick to the pan. In electric mixer bowl, whisk the eggs and sugar until your batter is light, fluffy and almost doubled in volume (about 10 minutes). In a large mixing bowl, whisk together the flour, baking powder, baking soda, and salt. Sift the flour mixture over the egg mixture and gently fold in with rubber spatula. In a medium mixing bowl, whisk together sour cream, heavy cream, vanilla extract, lemon zest and juice before folding into the batter. Add the cooled browned butter to the batter, again, gently folding in with a spatula. Don't panic if the butter looks like it is not cooperating at first. Just continue folding carefully until it is fully mixed in, while trying to maintain as much of the volume as possible. Finally, fold in the poppy seeds until evenly incorporated. Cover bowl with plastic wrap and refrigerate for at least 1 hour -- up to 24 hours. Pipe the batter down the center of each madeleine mold using a pastry bag with a large round tip. Each mold of the pan should be filled about 3/4 full. Let batter settle into the molds on it's own, do not spread! Bake madeleines at 400°F for 10-12 minutes or until lightly golden and there is a slight hump in the center of each cookie. 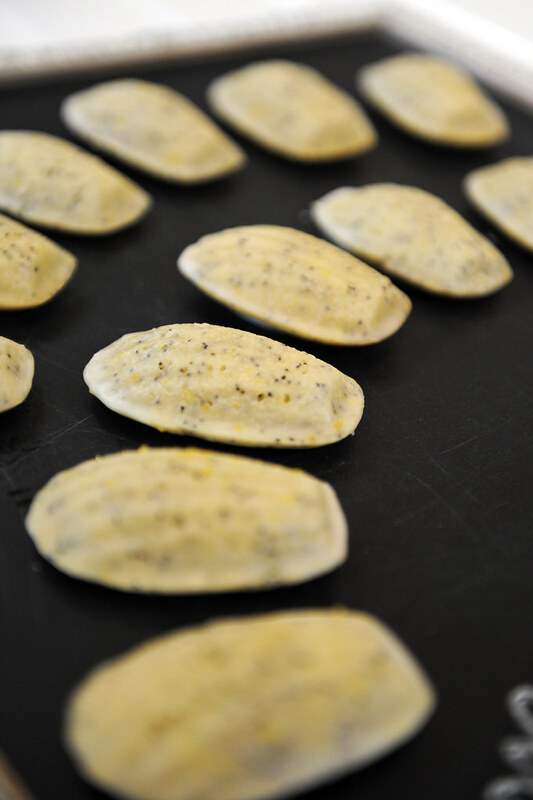 Remove from the oven and let cool for 5 minutes before gently removing the madeleines with a pairing knife. To make the glaze, whisk together confectioners' sugar, lemon juice and zest, vanilla and almond extracts, and milk. You can use more or less milk, depending on your preference of the glaze coating. I like a thin coating, so err on the side of more milk. Using your fingers, gently dip each madeleine into the bowl of glaze, letting excess drip off into bowl. Lay them out on parchment paper with the shell side up until the glaze dries up a bit. You can flip over onto clean parchment to let the bottoms dry too. These cookies are best when enjoyed the same day, but can be stored in an airtight container at room temperature for up to 3 days.